At the tender age of 13, Rubén starts studying gastronomy in the Escuela Superior de Hostelería y Turismo de Madrid, an opportunity for him to start out in what would later become his career and passion. Over the course of the next four years, taking advantage of the Christmas and Easter holidays, he gains experience at Pastelería Totel in Elda. Throughout these formative years, he also develops his skills in the dessert section of the El Chaflán restaurant and in the Aricate cake shop, both in Madrid. 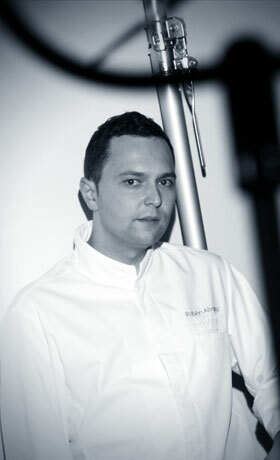 In 1999 he enjoys the opportunity to work as a pastry chef in Ibiza’s El Divino restaurant for the whole season. He also works for the Alarich restaurant in Novelda and in patisseries such as Dalua in Elche and Selvi in Aldaia, moving among several specilizations to get a complete knowledge. In 2003 his career takes a new direction under the guidance of Ramón Morató in Aula Chocovic, and for three years he splits his time between this and the Mas d’Osor restaurant (owned by Nandu Jubany). It is at this time that he discovers the exciting world of chocolate. He is currently involved in the development of products and recipes for the professional market and in giving courses both at home and abroad. A professional who is both restless and non-conformist, he brings his own personal style to his work which reflects the influence of other disciplines.